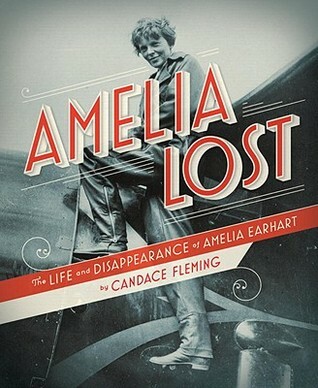 A Book for middle graders as well as everyone else: “Amelia Lost: The Life and Disappearance of Amelia Earhart,” by Candace Fleming (Schwartz & Wade 2011) begins with Amelia being lost somewhere on the Pacific Ocean on the last leg of her historic round-the-world flight–1937. Chapter two begins with Amelia’s birth, then being raised by her ladylike grandmother—1897. The book alternates between the harrowing days at the end of her life with the story of how she became Amelia Earhart, America’s darling and the renowned female pilot in the new aviation age. We discover how Amelia was a phenomenon of publicity—the result of George Putnam’s skill at publicizing her charm, enthusiasm and determination, then marrying her. Amelia was neither careful nor the most skilled woman aviator. On her first Atlantic flight, for which she gained much publicity, Amelia made decisions but did not actually pilot the plane. In a woman’s aviation cross-country race, Amelia in the fastest plane, finished third. An airplane manufacturer would not even sell her the aircraft she most wanted because she was not skilled enough to pilot it. We discover that Amelia’s character was, in part, built on her father’s decline into severe alcoholism. That she was a combination of tomboy and fashion maverick. That she was fiercely independent and publishing magnate George Putnam courted her for years before she agreed to marry him. As you read about the early years of aviation, you’re amazed at how frequently the equipment fails, fuel leaks or fires start on the wings. Early flight is not an activity for the faint hearted. Amelia was courageous to the point of being fool-hearty. For her final ill-fated flight, she was still learning to fly her Electra and hadn’t learned to use her radio equipment, which was her undoing. It is heartbreaking to discover that amateur short wave radio operators heard Amelia’s pleas for help as she was apparently downed in the Pacific, probably floating on the sea. A housewife from Texas never reported to the authorities her radio-contact with Amelia, figuring the authorities had it under control. A teenager in Florida could not convince the authorities of her hearing Amelia calling for help. A teenager in Wyoming rushed to the authorities to report his findings, which were reported to the scout ship Itasca—to no avail. This well-researched and suspenseful story is one reason we continue to care about the charming daring Amelia Earhart. “Amelia Lost” just won the Golden Kite Award for non fiction books. The prestigious Golden Kite, awarded by the Society of Children’s Book Writers and Illustrators (SCBWI), is judged by peers in the field of children’s literature. Congratulations, Candy! Patricia Hruby Powell (www.talesforallages.com) is a nationally touring speaker, dancer, storyteller, librarian and children’s book author. Her picture book in verse, Joséphine, about Josephine Baker and published by Chronicle Books will be released in fall 2013. ‹ Lights, Action, Roll ‘Em…with “Professor Puffendorf’s Secret Potion” by Robin Tzannes and Korky Paul. All parents like to think that they are able to aoffrd quality family time. And in fact, they can. Quality family time doesn’t mean you have to spend money at all. Ever heard of a park? You can spend all day at a park or hiking a nice easy trail and only have to spend money on snacks if you stay all day. You may also need to pay for gas if you choose to go far from home. Most neighborhoods have wonder parks for family time and it doesn’t cost you a thing! (except for tax money but that’s a given when you live in America.) To agree with the original poster, despite the recession and current economic situation of most families, it looks like business as usual when it comes to families spending money on entertainment.